The Holland Synthesizer Model SM2000 is a 3U Euro format* monophonic modular synthesizer. This is truly an aerospace quality musical instrument, designed for the most discriminating musicians, studios, and producers. The system uses a backplane that carries control voltages, triggers and audio signals to and from the various modules, however all patching can be overridden from the front panel. All jacks are Switchcraft 1/4" for ruggedness. The SM2000 is designed to be a standalone system, but being modular in nature allows for a high degree of customization. SM2014 Triple Voltage Controlled Oscillator/ Mixer Module. Each oscillator has six waveform outputs that can be mixed together. 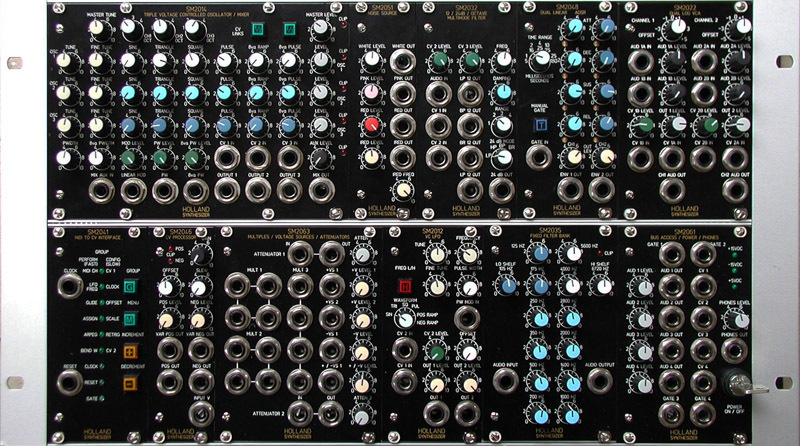 A fourth mixer combines the outputs of the three oscillators and an external signal source. Adjustable PWM and linear modulation. Coarse and fine tuning on each oscillator and a master tune for all 3 tracking together. SM2051 Noise generator featuring white, pink, red and infrared sources. SM2032 Multimode Voltage Controlled Filter. Has 8 outputs. Low Pass, High Pass, Band Pass and Band Reject (Notch). Each configuration has a 12dB and 24dB per octave mode. Four overlapping ranges with adjustable damping and manual frequency control. SM2048A Dual Envelope Generator. Two independant envelope generators tied to the same trigger. Time at each stage adjustable from 1 millisecond to 18 seconds. Level attenuators for each output. 5 overlapping time ranges, and manual trigger. LEDs track stages through envelope. Generates true linear envelopes. SM2022 Dual Log Voltage Controlled Amplifiers. Produces log output with linear input. Unheard of 118 dB dynamic range. Input and output level controls and CV attenuators. Manual offset controls for ease of setup and maximizing dynamic range. SM2041 MIDI to CV and Trigger Interface. SM2046 Control Voltage Processor. Takes in a control voltage and produces a copy and an inverted copy. Allows user to control offset, gain and slew rate. Also has two outputs for adjustable, attenuated versions of the outputs. SM2063 Multiples, Voltage sources and Attenuators. Has 3 four point multiples, 4 adjustable DC voltage sources and 2 adjustable attenuators. SM2012 Low Frequency Oscillator. Oscillator has two selectable ranges, high for modulation, and low for filters and amplitude modulation. Output waveforms are sine, triangle, square, pulse, positive ramp and negative ramp. Also has controls for tuning and fine tuning, pulse width, PWM attenuator, and two output level controls. SM2035 Fixed Filter Bank. This module has 12 resonant filters spaced musically at about half octaves. Each filter has 10dB of boost and cut. The highest and lowest filters are shelving type. SM2061 Buss Access, Power Monitor and Headphone Amplifier. Includes 4 volume controls for the audio output busses, and output jacks. Also includes jacks for the 4 trigger outputs and 4 control voltage outputs. Headpone output with level control. Power keyswitch and LED power indicators for each voltage. *Our modules are actually much more compliant to Euro format than most other manufacturers. The Euro format (which is technically called DIN 41612) specifies that modules will be a minimum of 160 mm deep and use a 96 pin connector to get power and signals to and from a backplane. This is far too expensive for most manufacturers. We adhere to the majority of this mechanical specification, except for our backplane which is optimized for audio signals. Therefore, our modules are too deep to fit in our competitors racks. We also use higher supply voltages and different power connectors than most other companies. However, our audio inputs and outputs, control voltages and triggers are compatible with most other Euro format synthesizers.